An Israeli aircraft hit two Hamas posts in the Gaza Strip on Monday in response to balloons carrying firebombs over the border fence to burn Israeli farmland, the army said. The strikes signalled a tougher Israeli response to the hundreds of balloons and kites carrying firebombs that have been launched from the Gaza Strip since April. Gazan security sources and residents said the strikes occurred in Beit Hanoun in the northern Gaza Strip and caused no injuries. Israel's army said the strikes targeted an area near where arson balloons were launched. A spokesman for Israel's fire service said four fires had been started inside Israel on Monday due to the firebombs. That was significantly less than the average of around 24 per day that had been occurring recently, said fire service spokesman Eli Cohen. The strikes came after the heaviest exchange of fire between Israel and Palestinian militants in Gaza since a 2014 war on Saturday. Israel hit dozens of sites it said belonged to militants in the Gaza Strip on Saturday, killing two Palestinian teenagers, while around 200 rockets and mortars were fired at Israel from the Hamas-run enclave. 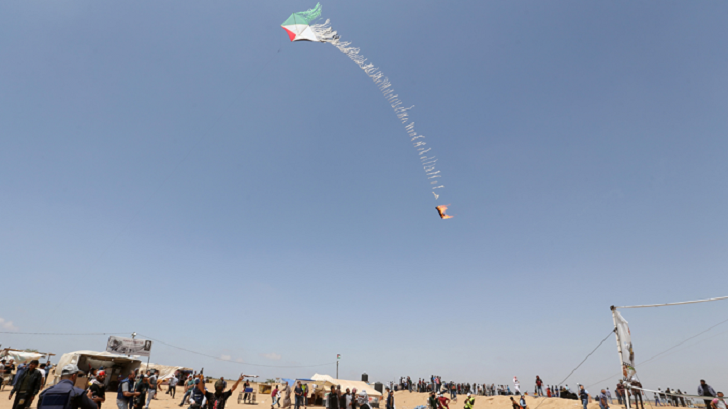 Hamas announced a ceasefire late Saturday, but Israeli Prime Minister Benjamin Netanyahu said the kite fires must stop. "I have directed the (military) to defeat and stop the terror of incendiary kites and balloons, and we are in the midst of the process," Netanyahu said Monday while visiting the city of Sderot, where four people were wounded when a rocket hit a house on Saturday. "There is an exchange of blows here. It is not over in one go."